Serial numbering scammers are a pain in the you know what. A few days ago I found a few collectors talking about this subject over on The Bench. They uncovered a seller who has done probably one of the worst serial numbering jobs I’ve ever seen. 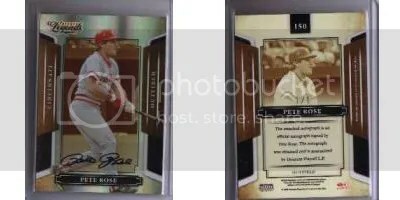 Take a look at these two basic Topps cards which seem to be “one of a kind”. When was the last time you saw cards from a basic Topps set contain serial numbers that look like this? Probably never. If cards like this are numbered at all, its usually done with very small font on the back. 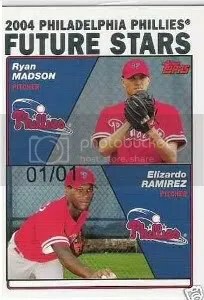 You also don’t find many regular Topps cards with one of one’s being printing as “01/01”. They usually don’t put zeros before the one. Luckily only a few of them sold and not all. The Dunn sold for the most and a couple others went for $5.00. This is just another case of when buyer’s don’t quite know everything about what they are purchasing. Be careful out there. 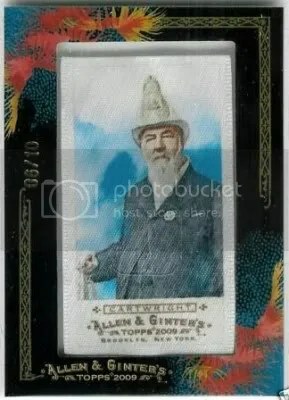 eBay and the card blogosphere is addicted to the new Allen & Ginter. It doesn’t matter if you hate it or love it, collectors are talking about it. Last week I decided to browse eBay to see if there was anything being pulled from A&G that would go great in my collection. I came across this Alexander Cartwright silk insert #’ed/10 and made the seller an offer. 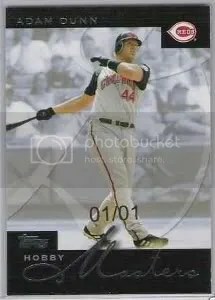 I like to collect cards of older players/figures and thought this would fit in. MLB recognizes Cartwright as the inventor of the game. ’09 A&G has more cards of him than any other product I’ve seen. He doesn’t have any relic cards and only has a few cut signatures. This is one card that will stay in my collection forever. Last night SCU reported about a Brady Quinn 2007 LCM Freshman Fabric rookie jersey/autograph that had been up for sale on eBay. The problem with this card is that Donruss never made any autographs like this. 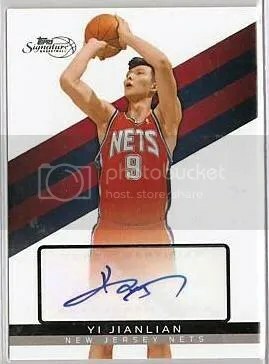 Scammers are now creating counterfeit sticker autographs. 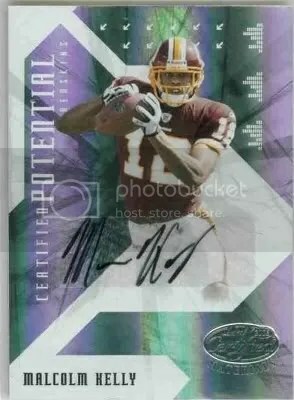 One of SCU readers suggested a way that someone might go about removing a crappy autograph from a sticker to replace it with a forged one of a better player, and then over at VOTC they created a video giving it a try. 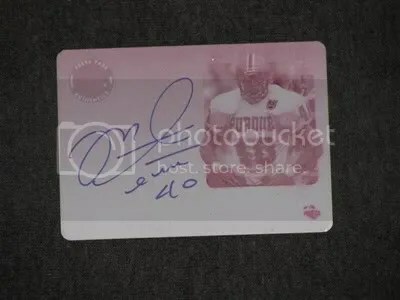 After watching that video it really makes you think twice about buying another sticker autograph online. This just makes on-card autographs look even better. Congrats to SCU and VOTC for doing such great detective work. Digging a little deeper I found this auction run by the same person who sold the Quinn. 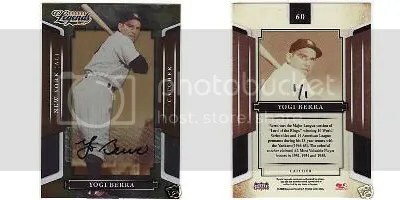 This Yogi Berra ’08 Sports Legends auto #’ed 1/1 doesn’t look to have the “shiny” border like the other autographs #’ed 1/1 from this product. At first I thought it might be the scan, but then another red flag popped-up when I looked at the back. The serial number is hand written with a marker, not stamped like the other 1/1 autographs. The final nail in the coffin would be the fact that the person with the high bid on the Berra has their I.D. kept private just like the Quinn auction. The only other hand-numbered 1/1 autograph from Sports Legends that I could find was this Jerry West. At first glance it looks to be from a different seller, but you can see they recently changed their I.D. and are located in Baltimore, MD. The Berra auto is located in Elkridge, MD which is not that far from Baltimore. I’ll report the Berra to eBay and hope they take it down. 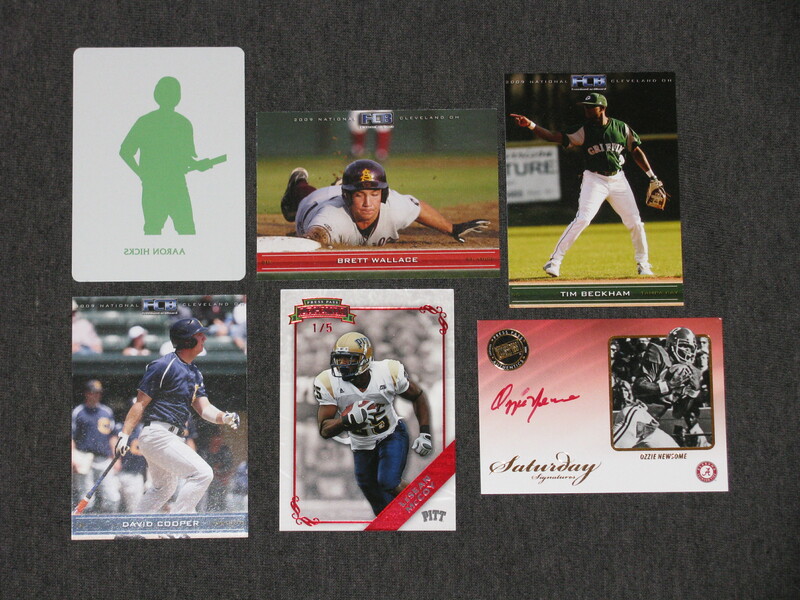 This is what an authentic 2008 Sports Legends autograph #’ed 1/1 should look like. Have you ever seen sellers using these different types of numbering when trying to describe a card? Many new collectors can make a critical mistake when reading the description. If a seller says “1 of 25” it probably doesn’t mean that there are only 25 copies of that card. What it means is that the card you are looking at is part of a 25 card set, and the card they are selling is #1 in the 25 card set. If you are looking to purchase a card that is serial numbered to only 25 copies, the seller should have it descibed as “1/25”. This isn’t always used to scam buyers, but sometimes it can. Most of the time it is just a miscommunication between the buyer and seller. Refractors and parallels are an important aspect of the hobby today. Having a parallel numbered 1/5 versus 1/500 can have a huge affect on the price tag. If you plan to purchase one over the internet it is strongly advised that you get a scan of the back of the card. Many sellers try and use lights to make the card look like a different color. For example, if you turn a card a certain way it may change from a white color to a green. This can happen a lot with card from the Leaf Certified Materials sets. The card below is serial numbered to 100, but when you look at the picture, it has a green tint to it making collectors think that it is a Mirror Emerald insert numbered to 5. This can happen with a lot of products. The color of a card can change with any chrome like card. Bowman Chrome cards can really look different when they are scanned. Sometimes regular chrome cards can look blue and gold refractors can look orange. If your not too sure about what color a card is, always ask for a picture of the back so you can make sure what the serial number really is.